What’s the rarest bird you’ve ever seen? It’s an exciting question for any birder. As watchers, we are attracted to the big and the magnificent, especially if it’s rare. In 2013, BirdWatching conducted a poll, asking readers what birds they most wanted to see. California condor was No. 1, and whooping crane No. 2. Both of these federally endangered species were once on the brink of extinction. Today their small populations are so closely monitored that scientists know precisely how many exist in the wild and in captivity. You will never see a wild condor in Chicagoland. A whooping crane, however, is quite possible. It’s easily the rarest bird you could ever hope to see in our region. 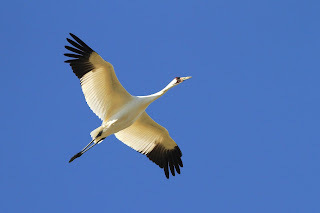 And thanks to the International Crane Foundation (ICF), a global center for crane conservation based in Wisconsin, our chances of spotting a whooper are gradually improving. 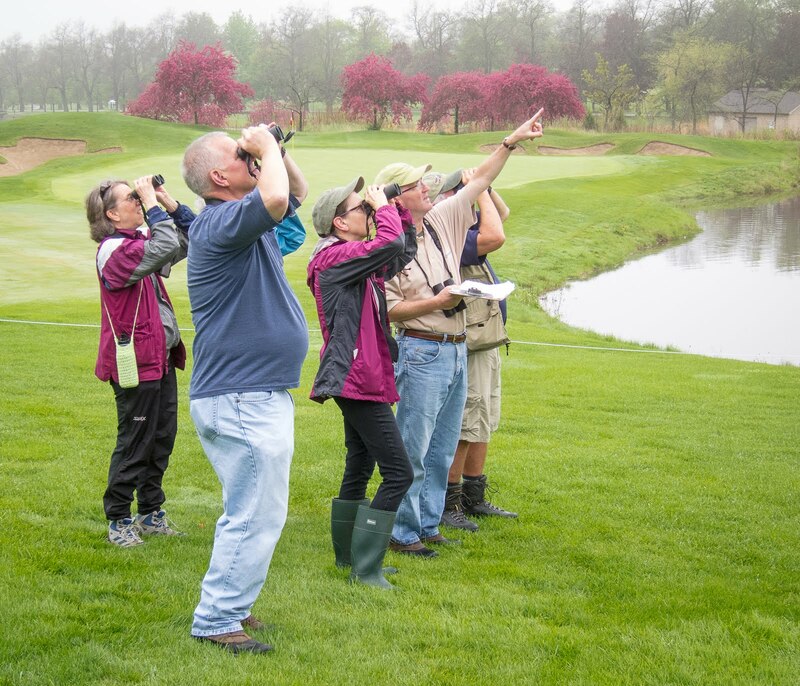 In May, the ICF’s Lizzie Condon addressed the DuPage Birding Club. She has a wonderful job title: Keeping Whooping Cranes Safe Coordinator. Condon’s role is necessary, if only because whooping cranes number just 450 in the wild. Another 160 support a captive breeding program. About two-thirds of the wild birds, known as the Western flock, migrate between Wood Buffalo National Park in Canada and Aransas National Wildlife Refuge on the Texas Gulf Coast. Small non-migratory flocks exist in Louisiana and Florida. down in Geneva on Thanksgiving Day 2012. Condon explained that progress is slow, often tedious and sometimes heartbreaking. Earlier this year, the U.S Fish and Wildlife Service announced an end to Operation Migration, the project that used ultralight aircraft to lead captive-bred whoopers on migration between Wisconsin and Florida. The new plan, “rear and release,” employs a more natural approach with less human intervention. A key issue is parenting. Unlike the stable Western flock, Eastern whoopers don’t seem to have a knack for it. Chick mortality in the East is alarmingly high. Now, captive adult whooping cranes in Wisconsin and Maryland will be tasked with rearing chicks, which later in their first year will be placed with wild adult pairs that experience nest failure. Ideally, the surrogate parents readily adopt the youngsters and show them how to migrate. The Eastern flock of free-flying whooping cranes is currently about 95 birds. If you see a whooper in DuPage it most likely belongs to this group. On the night she spoke to the bird club, Condon knew of five whoopers on the ground in Illinois. Indeed, the day-to-day whereabouts of many whooping cranes are well known by ICF staffers, thanks to radio transmitters attached to the birds. But the tracking technology is not a safety shield. The birds are still vulnerable. A shocking reminder of this occurred in January when two whooping cranes were shot and killed in Texas. The accused shooter will be tried under the Endangered Species Act and the ICF is pushing for a vigorous prosecution. In the last five years more than 20 whooping cranes have been lost to illegal shootings, some accidental and some not. Twenty birds! That’s a huge number when viewed in context. In the early 1940s there were fewer than 20 whooping cranes alive. It’s taken 75 years to build the population to current levels, and whoopers are still the rarest of the world’s 15 species of crane. The Texas incident triggered a national ICF campaign that aims to engage the general public in helping safeguard the species. 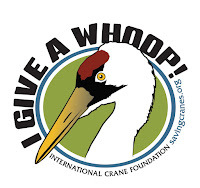 “I Give a Whoop!” is coordinated by Condon and includes a strong informational element so that more people will be able to identify whooping cranes and report any suspicious activity that may put them in danger. 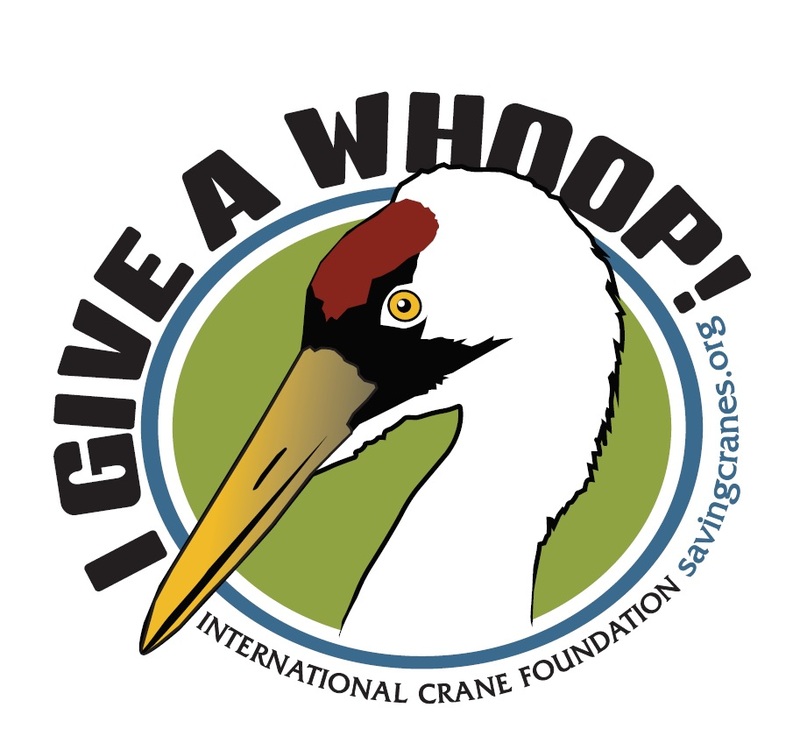 You can learn more and participate in the cause by taking a pledge at www.savingcranes.org/i-give-a-whoop/. Condon's work is also about getting kids and families excited about having whooping cranes in their communities. In January she spread the ICF gospel at the Festival of the Cranes at Wheeler National Wildlife Refuge in Alabama. Some whoopers from the Eastern flock join hundreds of sandhill cranes in making Wheeler their winter home. It’s a celebration complete with Whooping Crane Red Ale from a local brewery. The ICF’s outreach efforts include a larger-than-life mascot appearing at public events in areas where whooping cranes live or migrate. Her name, appropriately, is Hope. I’ve never spotted a whooping crane in these parts. The only one I’ve ever seen was in Nebraska back in 1998. But every spring and fall I’m looking up, watching those large and loud flocks of sandhill cranes carefully. Occasionally one or two whoopers migrate with them, their white bodies and black wingtips setting them apart from the gray sandies. Whooping cranes will always be rare, at least in my lifetime. The species will not be downlisted from “endangered” to “threatened” any time soon, if ever. But I’m thankful that free-flying whoopers still exist at all, and optimistic that the work of ICF and its partners will secure their future. I give a whoop. If you do too, please go online and take the pledge.